If you want to know more about the information shared with parents during this session. This training is designed for parents of Reception children. Below are a selection of resources that will support you in helping your child make good progress in reading. Please do not hesitate to contact school if you would like more information. 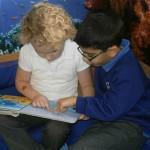 R-U Ready 4 Reading Reception Autumn 2013. R-U Ready 4 Reading Information Leaflet. Here are a few useful websites that will help your child’s reading develop.